What makes our Superior Rooms superior? Expect extra space and views that are as good as they get. 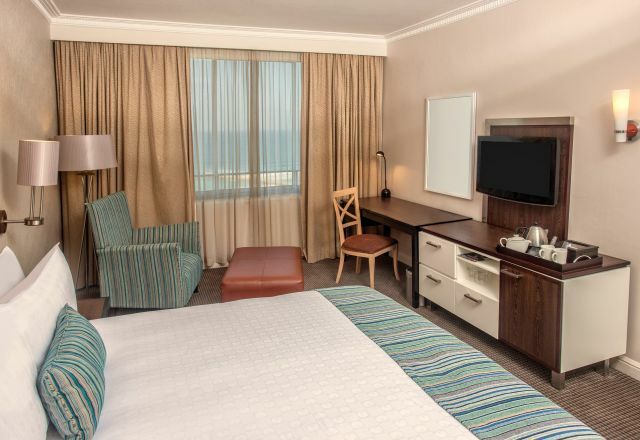 On top of that we’ve fitted our superior Durban accommodation with a large flat screen TV including a great choice of DStv channels, high speed in-room WiFi, a comfortable armchair for taking in the view or catching up on some reading and a number of thoughtful amenities. Go Superior and enjoy thoughtful extras like a comfortable armchair, some extra space and the best views. Superior Rooms at the Southern Sun Elangeni & Maharani hotel have an en-suite bathroom, boasting spectacular sea views and a host of amenities.